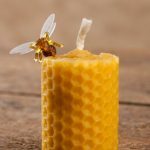 Did you know that beeswax candles can help improve the air quality in your home by releasing negative ions that bind with toxins and remove them from the air? In fact, natural beeswax has a variety of handy household uses that you might not be aware of. Check out a few of our favorite uses for beeswax below! Is there a drawer in your bedroom dresser that tends to stick when you try to open it? Apply a thin coat of beeswax to the rails inside the drawer and it should begin to open and close smoothly again. You can take the same approach to loosening old windows that get stuck in their frames. Do you have an old wooden cutting board that has seen better days? You can breathe new life into it by combining one cup of mineral oil with a half teaspoon of beeswax. Microwave this mixture until the beeswax melts and use a soft cloth to rub it into your cutting board. This will condition the wood and improve the appearance of its finish. Want to make sure your work boots will keep you dry on rainy days? Beeswax offers an easy, inexpensive way to waterproof boots and other leather goods. Just combine equal parts beeswax, neatsfoot oil and tallow, then warm the mixture before using a rag to rub it into the leather. This trick can not only keep your feet dry, but also extend the lifespan of your leather goods. At Marshall’s Honey, we offer food grade beeswax by the pound that you can use for all sorts of things around the house. Place your order online or give us a call today at our toll-free number to learn more! ← Download a Free Valentine From Marshall’s Honey!